Synopsis: Will a mother’s wrath make her cross the line? I didn’t want to cry. For once in my life, tears evaded me. Perhaps because I refused to grieve this loss, because it wasn’t a loss in my eyes, in my heart. It was a call for war, yes. But not a loss. I wouldn’t allow it. As I curled my body around Sasha’s, though, I realized the anger within me had changed. I no longer felt irrational and blinding fury that dulled all other emotions. But that was okay. I really didn’t want to be Psycho Alexis. This, what I now felt in every cell of my body down to the core, was better. My anger had condensed and solidified into a cold, hard stone settling within me. Something I could control and hold onto for the long term to keep me going and focused on the goal. 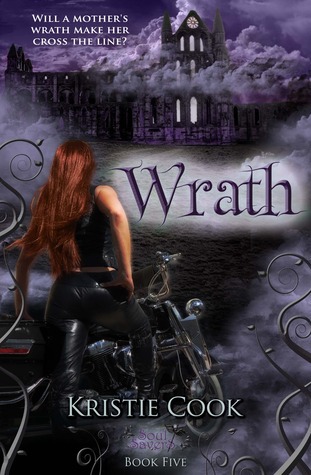 Wrath, the fifth volume in the bestselling, award-winning Soul Savers Series, will have you on the edge-of-your-seat-ravenously-devouring-junk-food as you experience the mysteries, magic, betrayals, and passion that you’ve come to expect from Kristie Cook’s writing. Review: 5 Stars - Today I’m excited to review and talk to you about Wrath, the 5th book in the Soul Savers Series by one of my favorite authors, Kristie Cook. As always with reviews posted here, I’ll keep it spoiler free. WOW… I think that was my mantra while reading this one, well that and reminding myself to breath. Throughout the series so far, Kristie has kept the tension high, the action fast paced and the romance steamy. In Wrath, well let’s just say that she has yet again out done herself. For me, Kristie’s writing and her characters take the center stage. We’ve watched them all grow and change from the first book right through to this fifth one. The emotional journey in Wrath was high, the stakes were higher and the action non-stop! I guess I should talk about the end of Power which left me stunned. I was speechless. I was emotionally strung out. In Wrath the story picks up right where we last left Alexis, Tristan and company. The gaping holes left by some of my favorite characters were felt. My heart hurt time and time again while reading. I guess what I’m saying is that Wrath is an emotional roller-coaster or a novel. Have some tissues ready. I think for me this book and Power have been the hardest because of my love for Owen. It’s been a rough ride and I cringed just about each and every time he was mentioned. I mean he’s a fictional character, a book boyfriend if you will and even I feel betrayed! I was lost along with the characters while we all tried to figure out what his motives were for doing the damaging things he did to those we thought he loved. With Wrath we have a chance to see a different side of Alexis. I think we’ve seen glimpses of this Alexis in the past, but the title for this book more than fits when it comes to a mother who’s had her child taken away from her. She has the weight of a whole people, society and the good of the world on her shoulders and with the loss of her son I think she held things together pretty well. There’s one scene with Tristan that I was shocked over, but it gave us a chance to see just how flawed she really is. Same with Tristan, he might have been created to be the perfect warrior but he has flaws. He hurts just as hard as he loves. Gosh there’s so much to love about these books I guess if I had a wrap this review up in a couple of sentences I’d say this - Wrath is an extremely powerful and emotionally charged addition to the Soul Saver Series. Kristie continues to take readers on a journey that left this reader breathless right through to the last page! With fierce characters, spot on writing, thrills from beginning to end, steamy romance, and captivating stories… what more could you ask for? I’m without a doubt excited that I’ve had a chance to get to know these characters from early on and I will be reading and cheering for them right through to the end! I’m not sure why more people don’t know about these amazing books… why more aren’t reading them but let me tell you; once you start you won’t be able to stop. They’ll have found a spot in your heart and you’ll be begging for me along with the rest of us. I HIGHLY recommend this amazing series and author to everyone looking for books that have the x factor. Seriously. SERIOUSLY… happy reading.